There once was a young artist called Karou who drew tales of monsters and demons that delighted and enthralled those around her. But she has a secret, a secret that ties her to a dusty subterranean chamber, where her beloved guardian brokers dark deals in a place that is not here. A place that is Elsewhere. Living with one foot in each world, Karou has never really known which one is her true home. Now the doors to Elsewhere closing . . . Thoughts: I was expecting great things from Laini Taylor, and I got them. I got them in spades. Daughter of Smoke and Bone is probably the most unique paranormal Young Adult novel I’ve ever read. Absolutely everything took me by surprise: the characters, the universe and – amazingly – even the romance. Daughter of Smoke and Bone starts off in Prague, narrated by multi-lingual, blue-haired, and tattooed Karou. In between trips to gothic cafes and studying at an art school, she tries to keep up a secret life in a magical world. And before you start imagining Diagon Alley, let me clarify. Karou’s other world is filled with body parts and bizarre creatures, it is rough around the edges and dark in the centre… dark but not evil, per-say. While there are plenty of more detailed reviews out there, you really should not know more than that. Because past the introduction? Everything goes haywire. 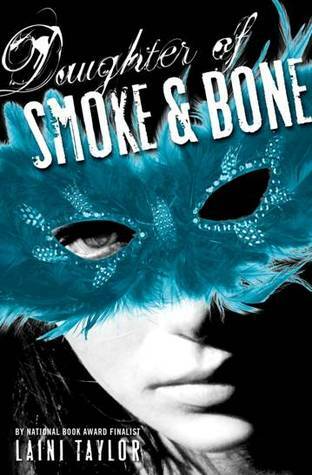 Daughter of Smoke and Bone is a book about angels and demons, but it is also not about angels and demons. It is about forbidden love, but it is about so much more than forbidden love. It is a book that takes every stereotype you’ve ever loathed and turns them into something magical and utterly unique. I was stunned by how Laini Taylor could make me accept things that – only ten pages before – I would have thought utterly implausible or unjustifiable. It turns out, all I needed was a stellar author guiding me! The only thing that keeps me from giving this a full five stars – and there really is only one thing, this novel is almost perfection in writing – is the central romantic relationship. While I loved both characters individually, I wasn’t completely sold on them together. I think I just need some more time to become enamoured with the two of them together… something the next novel should accomplish! Bottom line? Daughter of Smoke and Bone is a book about wishes and monsters, hope and betrayal, love lost and love found, teeth and smoke. Read it. Daughter of Smoke and Bone is out today in the UK. Go get a copy! I keep hearing such good things about this book. I don’t have a copy; I only have the preview that was released, but if that preview is half as good as people are saying, I think I’m going to want to go and buy myself a complete copy of this book ASAP! I just got my copy of this in the mail and cannot wait to read it. Every review I have seen has be so positive. Sounds like an immediate read. Thanks for the great review. This was withoit a doubt one of the most amazuling books I’ve read in a very long time. Wonderful, wonderful rlwriting and a truly astonishing world. I saw no bits of any other story. She created a world so intricate in its cimpleteness and originality that i have been left with the destinct impression, and macbre hope, that Elsewhere is real. This is a book worth camping outside for a sequel. Entirely unforgetable!!!!!!!! !